A water-soluble film dissolves in water, leaving inks on the surface. The part is dipped into the water, causing ink to wrap around it. Water transfer printing allows the application of printed patterns to three-dimensional products in a variety of industries. Even though the technology for water transfer printing has been around for more than 40 years, the process began attracting mass appeal in the last 10 to 15 years. The technology sometimes is referred to by other names, including hydrographics, hydro dipping or hydrographic printing. Whatever the name, the process is the same – a high-definition, 4-color graphic pattern can be transferred to many complex 3D shapes using a water-soluble film. For years, the automotive industry has embraced the technology, using the process to apply decorative trim throughout vehicle interiors. Early on, the sporting goods industry found that water transfer printing was ideal for applying camouflage patterns to gun stocks and bows. Today, the technology is used across multiple industries, including manufacturing, construction and engineering. Water transfer printing (also known as hydrographics, immersion printing, camo dipping, hydro imaging and cubic printing) is a surface decorating process with which elaborate graphics – such as wood grain, carbon fiber, camouflage, geometrical designs, etc. – are applied to a 3D product surface. The water transfer printing process is extensively used to decorate items that range from entire all-terrain vehicles and car dashboards to small items, such as bike helmets or other automotive trim. The process utilizes a water-soluble film that contains the printed patterns. The film dissolves in the water and leaves the ink on the surface. In the typical process, the item to be printed is first coated with a primer or an adhesion promoter. After this dries, a base coat paint is applied to control the hue of the pattern. For instance, wood grain prints often utilize a brown base coat, and many camouflage patterns use a neutral base. After the base coat is applied, the item is ready for decorating. The film is activated using a chemical activator. The item then is dipped into the water, and the ink wraps around it. After decoration, the part must be thoroughly washed and dried. This can be accomplished with a drying room that is heated and has circulating air, thermal drying with heat or infrared, flash drying with heat lamps or blow drying. Ensure that the part is completely dry before proceeding. The final step is painting the part with a clear topcoat. One of the best features about the water transfer process is that films can be applied to all types of substrates, including plastic, fiberglass, wood, ceramics and metal. For the most part, if the item can be submerged in water and can be painted using traditional techniques, then the hydrographic printing process can be used. However, since the paint acts as a bonding agent to which the inks adhere, all substrates – with the exception of ABS plastic – will require paint to be applied before the actual dipping process is performed. Depending on the type of substrate, surface tension modification may be required to achieve adhesion of the base paint to the substrate. Several variables will affect overall productivity. Some operations are geared toward custom aftermarket processing, and others require an output of millions of parts per year. Either option is the norm these days. An operation can be set up to process purely custom jobs – such as automobile interior components, wheels, etc., using all manual steps and operations – or a fully automated line can be established, using conveyors and robots to apply the paints and to perform the water transfer process. Even in the aftermarket custom shop operation, automating certain aspects of a production line will increase overall efficiency. For example, incorporating products such as a robotic arm to submerge the part in the processing system or an automated spraying system to apply the chemical activator would cut down on total production time and increase volume. The ink films are printed on Polyvinyl Alcohol (PVA) based film. It is very sensitive to moisture and temperature, requiring proper storage to ensure long shelf life and proper decorating. The film must be stored in a humidity- and temperature-controlled environment, preferably with humidity below 60 percent and the temperature ranging from 68° to 77°F. By most standards, the water transfer printing process is relatively environmentally friendly. However, several aspects need to be addressed with the proper environment regulatory agencies. If the decorating company can obtain a permit to apply the base coat and top coat paint, it should have no problem implementing the process. However, by no means does that imply that additional regulatory compliance is not required in the facility. It is the responsibility of the business owner to verify the company is in compliance with all federal, state and municipal requirements. How long has the company been in business? Longevity points to success in providing services in the industry and also serves as a good indicator of staying power. How many full-time employees work for the company? When companies have a well-structured employee base, they are able to provide a strong support system for their customers. Does the company have experience working with high-volume manufacturers? This indicates a knowledge base in setting up a production line that is both efficient and cost-effective. It’s sometimes difficult to believe that water transfer printing technology has been around for more than 40 years. However, its popularity recently has exploded, and one can find the process used in almost every vertical (automotive, sporting goods, aviation, marine and industrial). This is due largely to the versatility of the process. 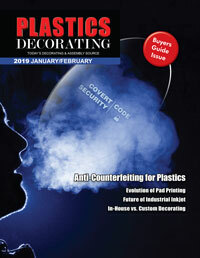 Water transfer printing truly allows decorators to customize the look of a company’s products. And, with the hundreds of patterns available from which to choose – camouflage, wood grains, metal, stone and even custom-made designs – incorporating these designs is a sure way to uniquely brand a company and, ultimately, increase sales. Victor Rojas is the digital marketing and communications project manager for TWN Industries, Inc. TWN Industries, Inc. services all aspects of the surface coatings industry. Internationally known as experts in the field of water transfer printing, TWN offers a wide selection of hydrographic printing equipment and film in both stock and custom sizes for static, continuous flow, and the Cubic® printing method. Areas of focus include automotive, marine, sporting goods, aviation, general industrial, medical, home decor and architectural markets. For more information, call 305.258.9622 or visit www.watertransferprinting.com.